Crafted from fresh sterling silver, this slender bangle features an entwined lattice design with sparkling diamond embellishment. Versatile with an elegant sparkle, this 10 point diamond bangle is suited to all occasions whether day or evening. 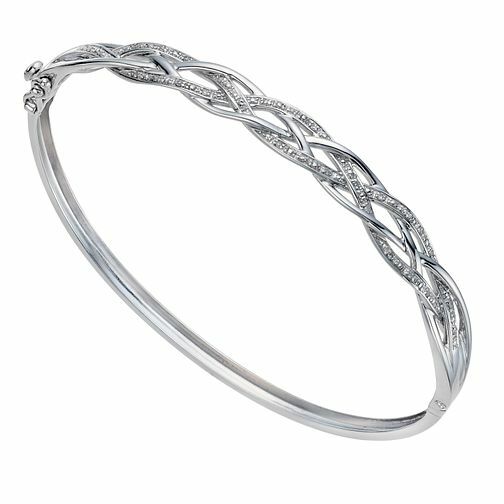 Sterling silver 10 point diamond lattice bangle is rated 5.0 out of 5 by 2. Rated 5 out of 5 by Anonymous from She loves it! Bought this as a gift for the wife and she loves it. Happy wife, happy life! Rated 5 out of 5 by Anonymous from Beautiful bangle This was a surprise Christmas present from my Mum - it's absolutely gorgeous - very stylish and understated. It really sparkles - pave diamonds are just lovely. Love it!